Royal Crown Hotel & Spa is a perfect hotel where located in the central of Siem Reap town nearby King's Road, Hard Rock Cafe, Old Market, Night Market, Pub Street, and Angkor Trade Center. 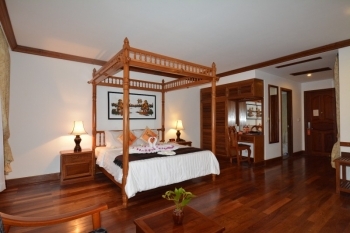 Royal Crown hotel & Spa is encompassing blend of Khmer traditional decoration with the wooden floors, Carving, and some part looks similar to French colonial building style. Furthermore, Each room at our hotel is set up with an air condition, Wi-Fi usage, and fitted with a flat-screen TV with cable channels. Some units have seating area for your convenience. The View of pools, garden, or city featured in certain rooms. Extras include bath robes, slippers and free toiletries.Particularly, Hotel have 2 swimming pools, Massage room, Business center,Sky lounge ,Restaurant, Tour desk, and private parking area. Each room offers either a city view through floor-to-ceiling windows.